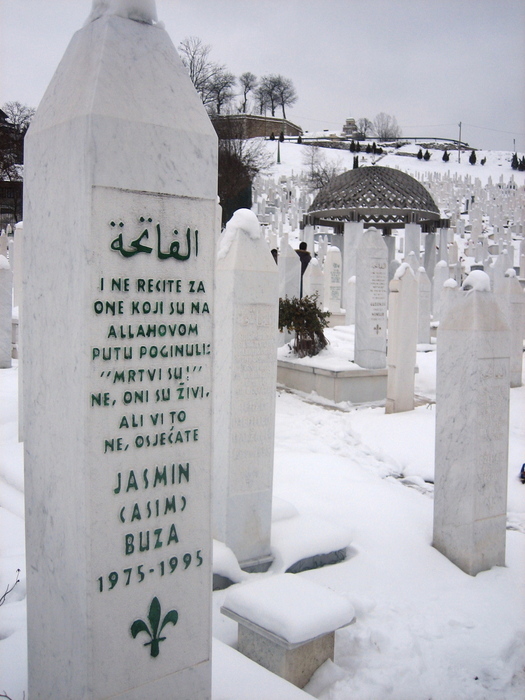 One of many cemeteries in which heroes (or martyrs) and victims of the Bosnian war are buried, the Kovači, or old town, Cemetery also is the final resting place of Alija Izetbegović, the first president of Bosnia & Herzegovina (BiH). His grave is under the grey dome shown in this picture and is guarded by military personnel. 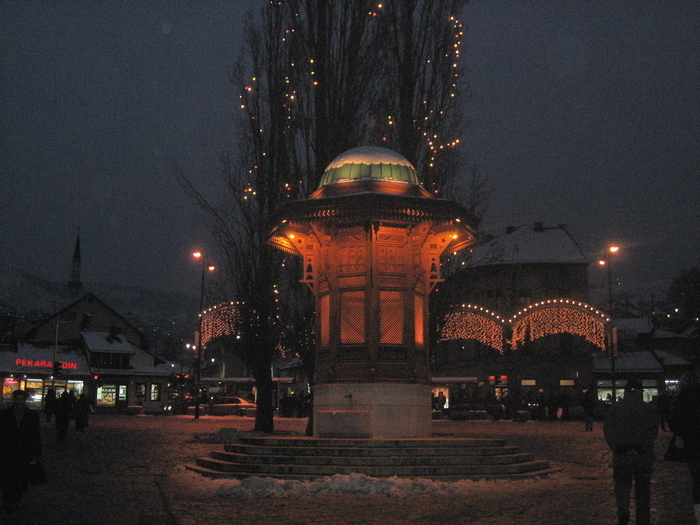 Built in 1891, Sebilj is the fountain in the center of the Baščaršija district and is one of the primary symbols of Sarajevo. It is said that once you drink its waters, you can never leave Bosnia for too long. Sebilj comes from the Arabic word "Sebil" which means "road." 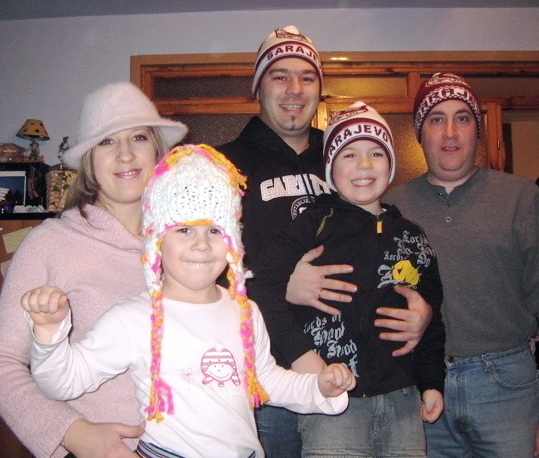 Judy is pictured here with Zummie and her family: mom Enisa, brother Eldin, and dad Sejo. Baščaršija is considered to be the main street of Sarajevo and one of its most important landmarks. 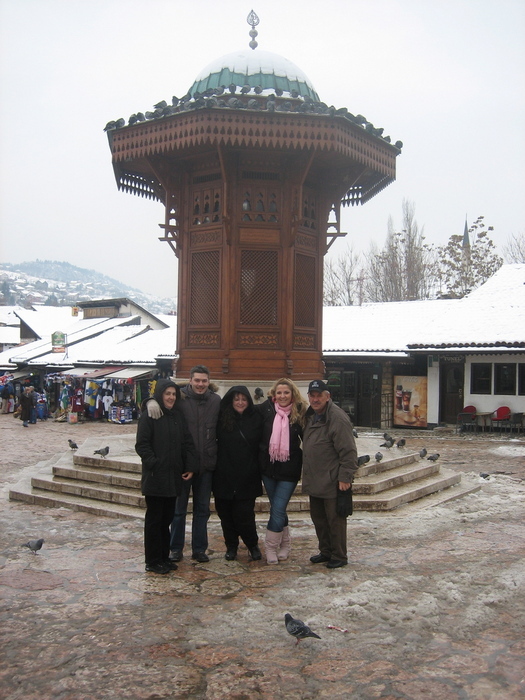 It is located in the old town of Sarajevo, designed in the Ottoman-Turkish style, and loaded with shops and public fountains, such as the Sebilj. The Baščaršija Džamija, or marketplace mosque, was built in 1530. Today, as happens several times every day, we watched and listened to the iman giving the call to prayer, or the ezan, from the mosque's minaret. 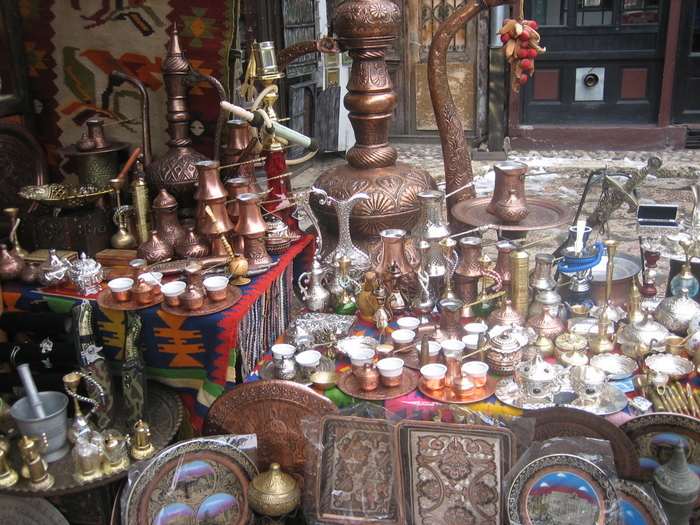 Baščaršija has many shops where traditional Bosnian crafts are made and sold. Zummie, who knew several of the local shopkeepers, took us to her favorite shops where we did quite a bit of window shopping and a little bit of real shopping. Bosnian ćevapi from the Baščaršija district of Sarajevo are probably the most famous ćevapi in the Balkans. 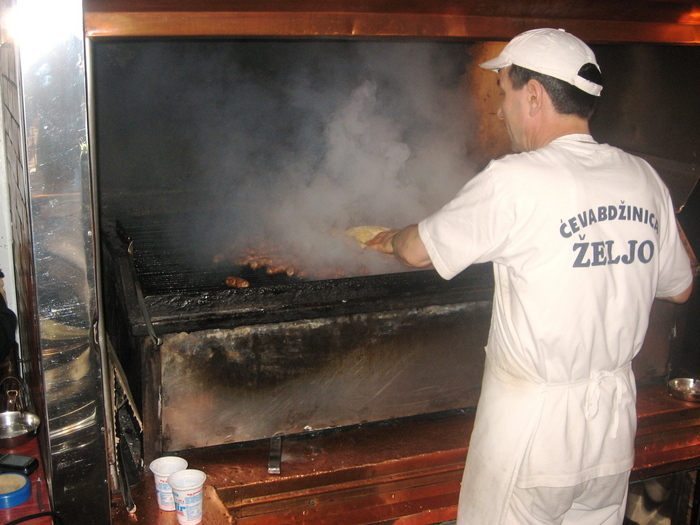 Ćevapi are small rolls of grilled beef served with a type of cream cheese, chopped onions, and grilled flatbread. We once tried to make them at home for Zummie, and even though she kindly said she liked them, now we know how far ours missed the mark! The ćevapi we had today were out of this world! 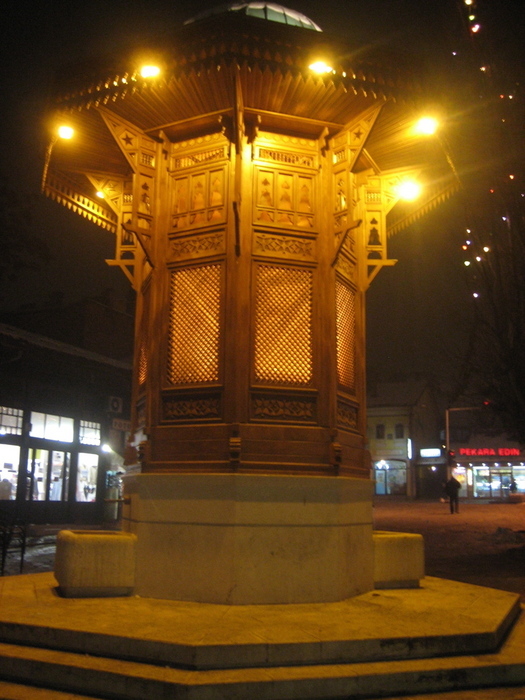 The Sebilj was modelled from Moorish fountains and copied from the stone sebilj in Constantinopole. Part of its beauty at night is that the pigeons normally filling the square and drinking from the fountain are gone. Guess they will be back in the morning, perhaps due to the legend associated with drinking from the fountain's waters. 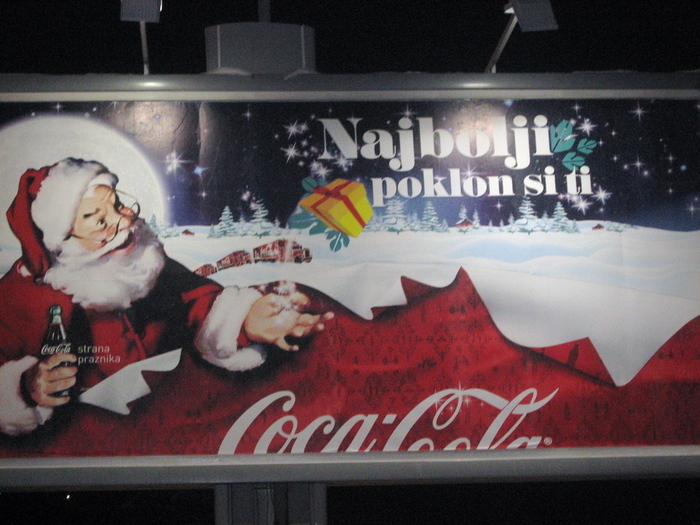 Santa Claus in Bosnia, a predominantly Muslim country, is more of a secular figure and is associated with the new year. No matter what one's religion or country of origin, we all can agree on the proclamation of this billboard...the best gift is you! Today, Eldin and Zummie took us to the ruins of the Bijela Tabija, or white castle, in the Vratnik mahala (neighborhood) of Sarajevo. It's located in the hills around the main city. From one side of the castle ruins, we looked into the Republic of Srpska, the small Serbian part of Sarajevo created by the post-war Dayton Accord in 1995. Looking down into the main city of Sarajevo, the view was also spectacular. The large tan building in the middle to the right is the National Library on the banks of the Miljacka River. It was constructed in 1892, and exactly 100 years later, centuries of history went up in flames when Serbian forces bombed this national monument. Everything was lost. The building is in the process of being reconstructed. 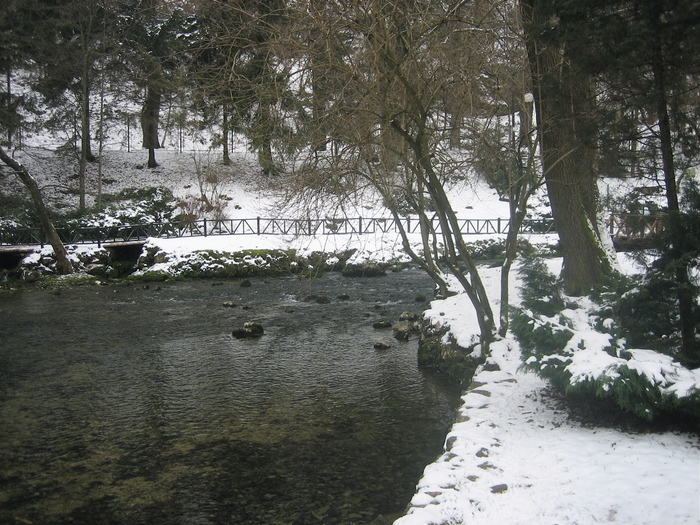 The source of the Bosne River is located just outside of Sarajevo. The springs which are the source have been surrounded by a lovely park with paths and bridges that follow the river. It is also the home to several hungry, bold swans and ducks. While it was a beautiful setting, we can only imagine what the park must be like in the warmer weather, when the snows have melted and the leaves and flowers return. Every day, we have stopped to have coffee in some wonderful places. This one is in the Vrelo Bosne park, where Ken, Eldin, and Zummie wait for their coffees. Mostly, out and about, we have been sipping on espresso and capuccinos, but at Zummie's house, her mother Enisa has been making us real Bosnian coffee. That is an experience in and of itself and so delicious! In 2005, Bosnia received international attention when it was announced that Semir Osmanagić, a Bosnian-born American, believed and had some evidence that ancient pyramids had been found in the hills outside of the town of Visoko. 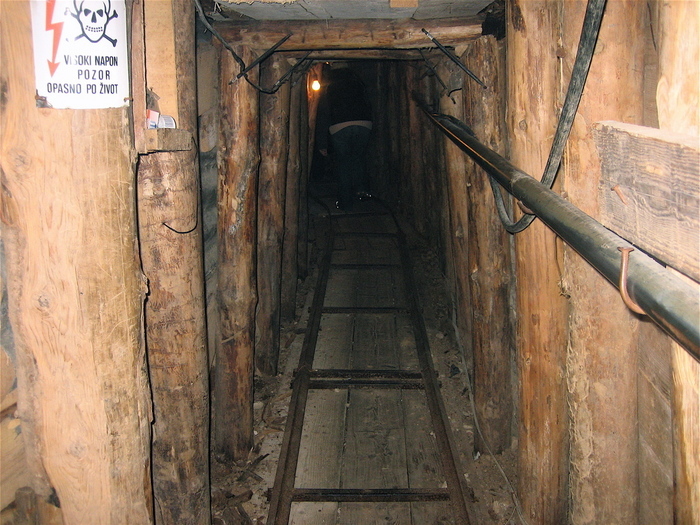 A full-scale dig began in April of 2006. In this picture, we are standing on a hill called the "Pyramid of the Moon", while behind us are several nearby hills that have been dubbed the "Pyramid of the Sun" and the "Pyramid of the (Bosnian) Dragon". These claims are quite controversial, as a search of the Internet will show. But, standing there and looking at some of the man-made stone formations that have been uncovered, it was certainly easy (and fun!) to wonder. Baklava is a rich, sweet pastry featured in many cuisines of the former Ottoman countries. In Bosnia, it is a pastry made of layers of phyllo dough filled with chopped walnuts and sweetened with a mixture of sugar and water. 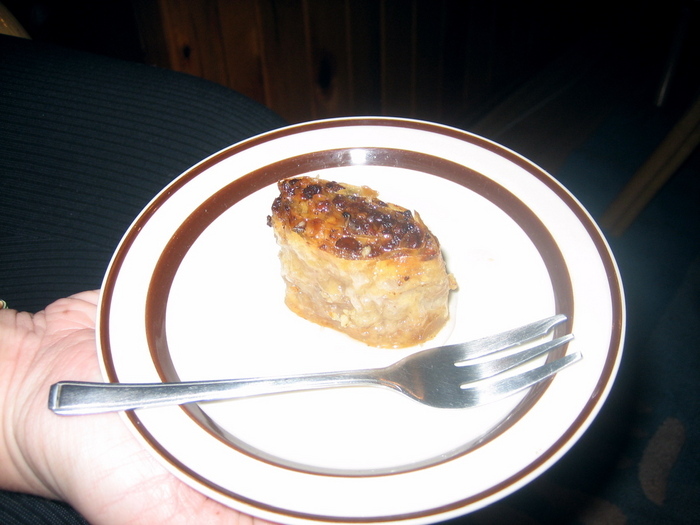 This piece of baklava was made by Teta, a well-loved family friend and neighbor. This piece of baklava was eaten soon after the photo was taken and was incredible! A legend that Zummie once found on the Internet but she and her mom had never heard before: Baklava will make a miraculous recovery of love if it appears that love is dying out. A girl who prepares baklava by putting her sincere love into her work and serves the baklava to a boy can be sure the boy will go crazy about her! Judy learned that making baklava is an arduous task. Enisa showed her step-by-step how it is made and even let her help out a little bit. Tomorrow is Bajram, a family holiday for Bosnian Muslims that is one of the most favorite of the year. We are so grateful that we have been invited to participate and to be included in the family traditions and celebrations...one of which will be having Enisa's baklava. Mmmmmmm! While we are in Sarajevo, we are staying at the Hotel Saraj, located just a few minutes' walk from the old part of the city. The hotel sits above the city on a hillside and has an extraordinary view down the Miljacka River over the city. We hopefully will post a picture of the view tomorrow. We were fortunate to be in Bosnia for the Bajram holiday. Eid-e Qurban (Kurban Bajram) is one of two Eid festivals that Muslims celebrate. Eid-e Qurban is celebrated by Muslims worldwide as a commemoration of Prophet Ibrahim's willingness to sacrifice his son Ismael for God. Typically men, women, and children are expected to dress in their finest clothing and perform prayer (Salat) in any Masjid or mosque. Muslims who can afford to do so sacrifice their best hooved animals as a symbol of Ibrahim's sacrifice. The sacrificed animals are called "Qurban", and the meat is equally distributed among the sacrificer's family, friends, relatives, and the poor and hungry. This morning, Sejo took us to the Gazi Husrev Begova Mosque to watch the Bajram prayer. Only men were allowed inside the mosque for this prayer; women would be allowed in later in the day. 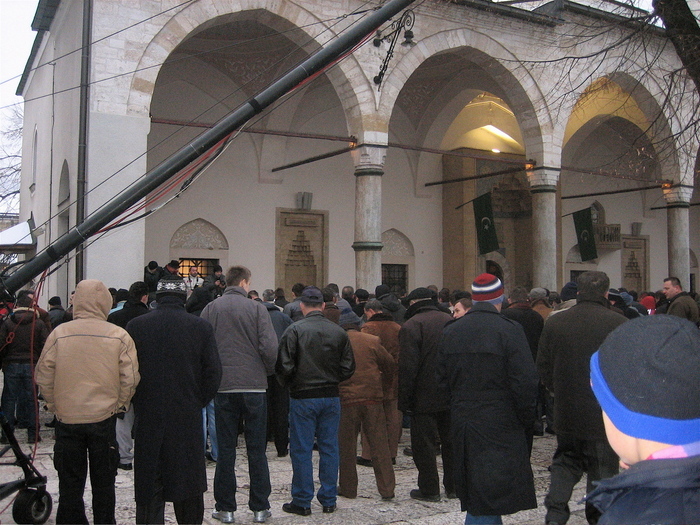 We simply stood outside the gates of the mosque and watched the solemn, beautiful ceremony. To hear the recital of the prayer done by so many men in a low, unison voice filled one with awe. 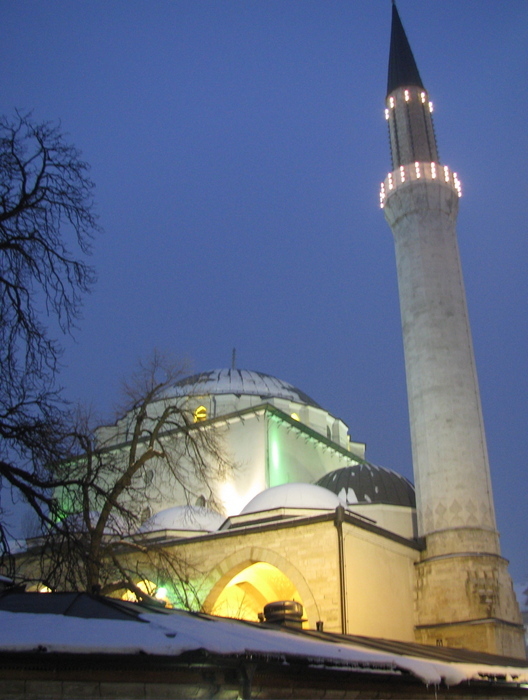 The Gazi Husrev Begova Mosque, located in the Baščaršija, is the most significant Islamic place in all of Bosnia & Herzegovina and perhaps the finest example of Ottoman Islamic architecture in the Balkans. The original structure was built in 1530 and reconstructed and restored several times. The last reconstruction was in 1886. Although it was damaged during the Bosnian War, the original design went unscathed. This is the front entrance, although we were not able to go inside because of prayer time. 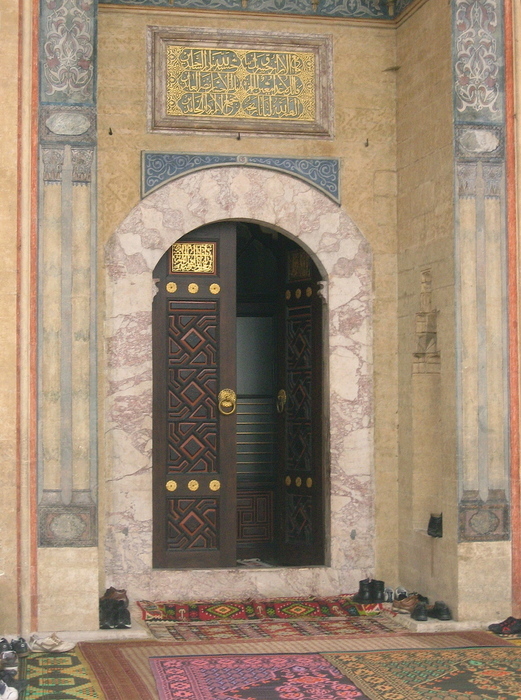 Notice the shoes outside the door, which must be removed and left outside before praying. We took this picture several days before Bajram. On the way home with Sejo, we passed the Latinska Čuprija. This is the most famous of the many bridges that cross the Miljacka. It was here on June 28, 1914, that Archduke Franz Ferdinand, heir to the Austro-Hungarian throne, and his pregnant wife were shot and killed by Gavrilo Princip. The political objective of the assassination was to break off from Austria-Hungary her south-slav provinces so they could be combined into a Greater Serbia or a Yugoslavia. This assassination sparked the outbreak of World War I. 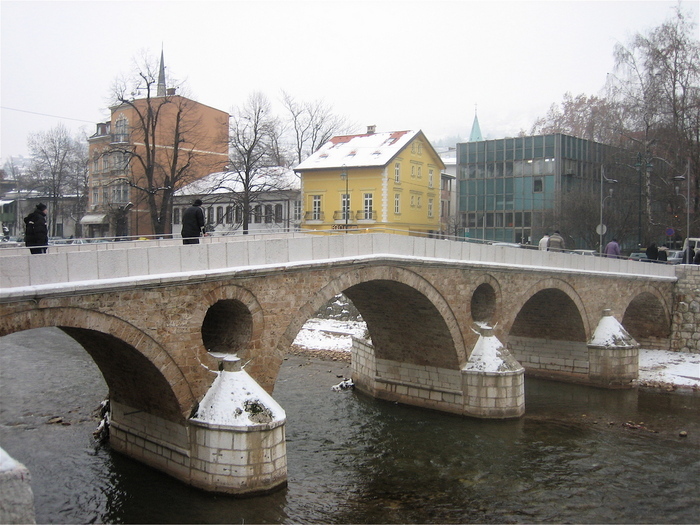 The bridge itself was built in 1798 as a legacy for Hadži Abdullah-agha Brigo, a merchant and philanthropist. After the assassination, it generally became known as Princip's Bridge, but in 1993, it was officially renamed Latinska Čuprija (Bridge). The bridge is located adjacent to the National Library. 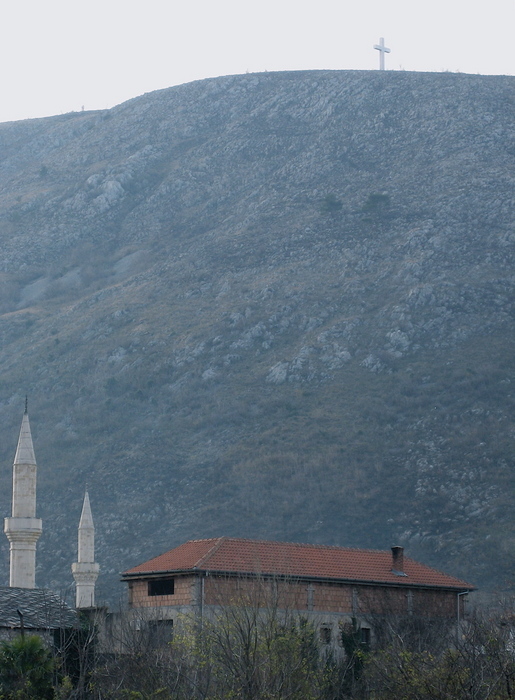 The Bajram holiday is one of the most cherished family holidays in Bosnia. As with family holidays throughout the world, there is a great deal of delicious food to enjoy. 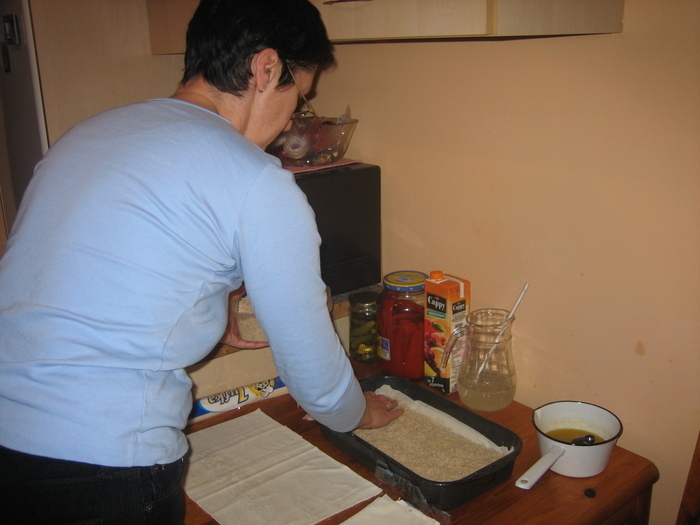 Enisa served several different types of pita (or pie) which are made by wrapping fillings in homemade phyllo dough, including Burek (beef and/or lamb filing), Sirnica (cheese filling) and Krompirusa (potato filling). The pita are in the photo on the right. 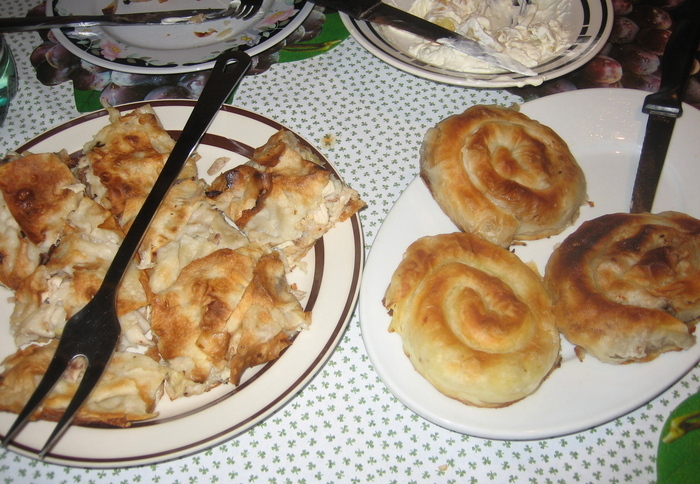 Seyo also made pita called Tirit, on the left in the photo, which is shredded chicken in between layers of hard phyllo dough, baked and softened with water. Also served were a wonderful soup for starters, pickled yellow peppers filled with cheese, and meat dumplings (that reminded me of Russian pelmeni that Kristina from Estonia has served one year at the Garrett College International Dinner) with fresh coarsely chopped garlic and sour cream. Of course, dessert was the heavenly baklava Enisa made yesterday! We rolled back to the hotel. Zummie's brother Eldin and his lovely wife Almira have two adorable kids: Haris (7 years old) and Lamija (4 years old). They are the light of Zummie's eyes, and she just can't get enough of them when she is home. Above, Lamija (left) and Haris (right) give their Tetka Zumra a huge kiss. Can you tell she is enjoying every second of it?? This morning, we slept late and woke up to a very foggy day, as you can see in this picture. Looking straight out our hotel window, we look into one of the hillside mahalas. This one has a cemetery from Turkish times which is visible on the right side of the photo. Looking to the right from our window, we see downtown Sarajevo. The large tan building with the dome is another view of the National Library. In front of the Library, notice the house that has been destroyed. It was most likely hit by a Serbian bomb during the war and never rebuilt. All over Sarajevo, we see signs of the bombing during the siege: bullet holes in buildings, shells of buildings, bomb craters, etc. 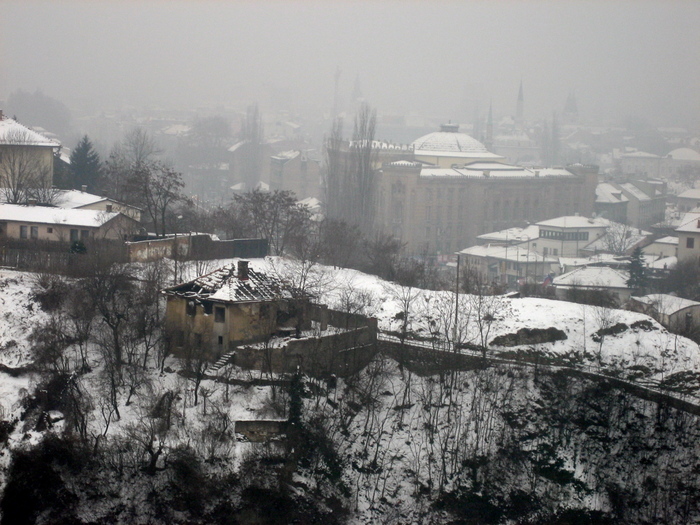 The siege of Sarajevo was the longest in the history of modern warfare, lasting from April 5, 1992 to February 29, 1996. A definite highlight of the trip has been all the wonderful Bosnian food and the warm Bosnian hospitality. Today, the second day of Bajram, we had a late lunch at Eldin and Almira's home that was absolutely delicious. The lunch included Sarma (pickled cabbage leaves stuffed with meat), cheese pita, meat pita covered with a yogurt sauce, roasted potato and chicken, and a baklava type of dessert made with apples. Eldin and Ken shared some Sarajevo-made beer. It was a delightful afternoon! Here is the official Balihodžić Bajram family portrait: Zumra, Almira, Sejo with Haris in front of him, Lamija, Enisa, and Eldin (notice the Garrett College and Bucknell hoodies!). They have completely opened their homes and hearts to us, and we feel so welcomed and loved. We will be forever grateful! After a leisurely lunch, we took a taxi back to the Baščaršija and walked around in order to burn off some calories. It gets dark here rather early this time of year, so we got some beautiful shots of the Baščaršija at night. 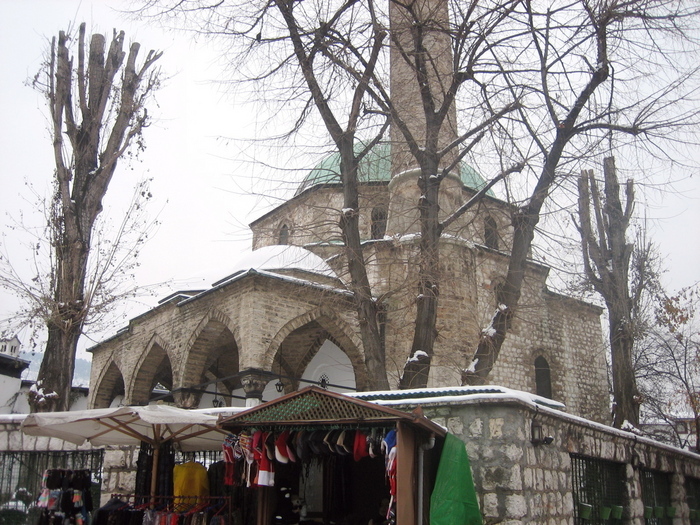 Here is one of the Gazi Husrev Beg Mosque. The Sebilj at night is gorgeous, so we couldn't resist another shot. Our walk around the old town only lasted about an hour or so before we started to literally freeze. 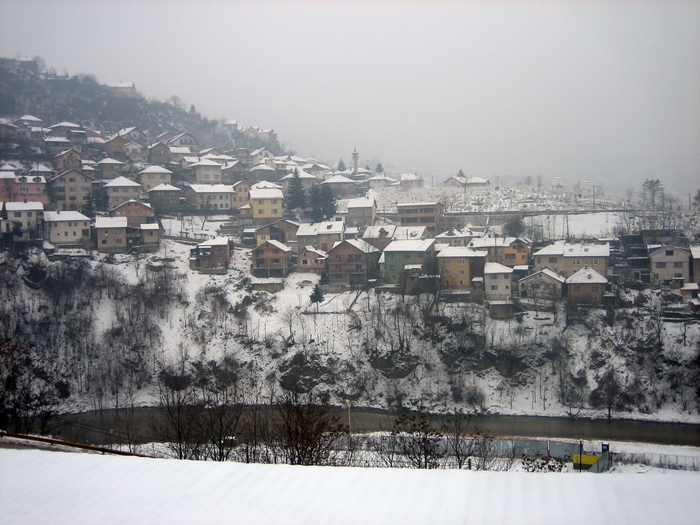 It's been cold, very cold here in Sarajevo with highs in the 30's F and lows below 20°F. This morning, we decided to do a little bit of touring and walking on our own. We walked down the hill from our hotel and crossed the Miljacka into the Bistrik district of the old town. We then traveled up Alifakovac Street into the eastern quarter of old Sarajevo to the Alifakovac graveyard, which we see when we look straight out our hotel window. 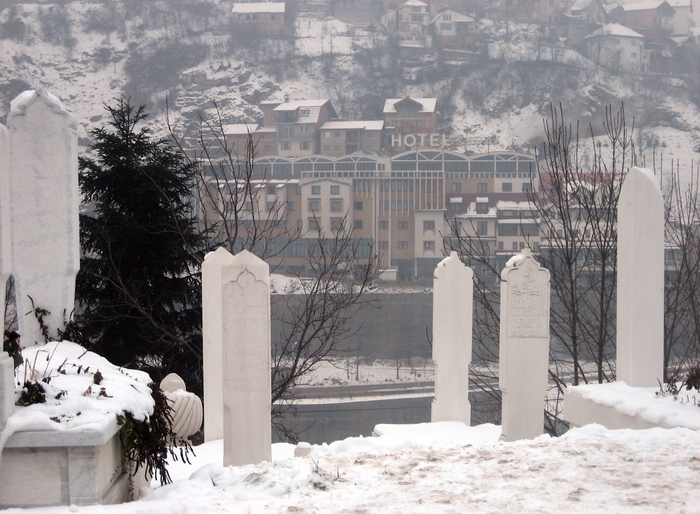 This photo shows the opposite view (graveyard to hotel) from the one we posted yesterday (view #1). The Alifakovac graveyard dates back to the Ottoman times and is a very interesting combination of old and new. 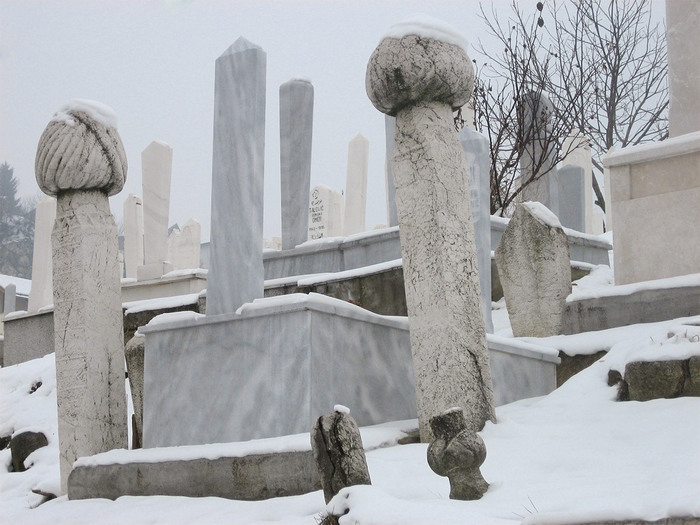 This photo shows tombstones from many different centuries in this Muslim cemetery. Notice that all are tall and narrow, with the older ones topped off with what resembles a turban. 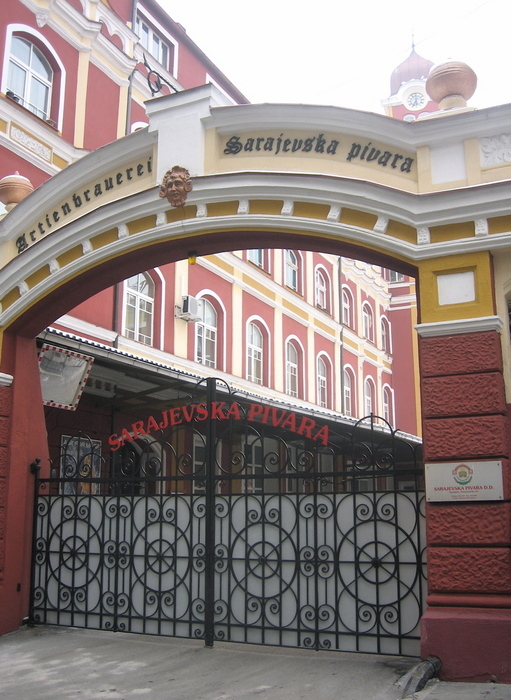 This is the Sarajevska Pivara (brewery). Most Sarajevans drink Sarajevska when they drink beer...Ken and Eldin did just tonight! It is a very good beer, but there is another reason Sarajevans are so loyal to this brand. 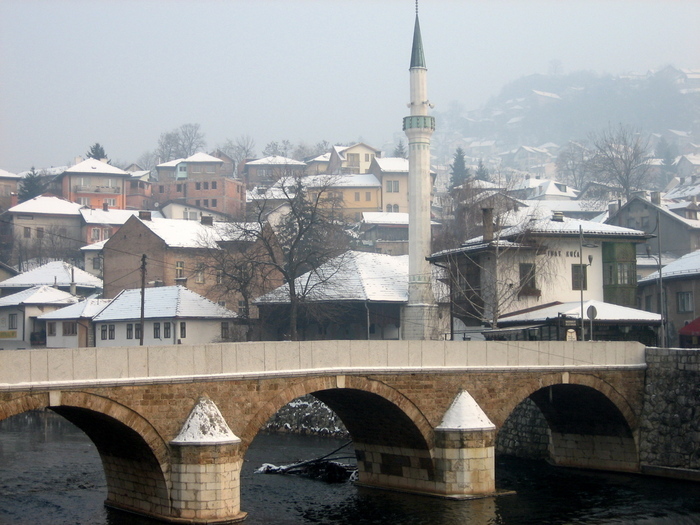 During the Siege of Sarajevo, all water was cut off from the inhabitants of the city. 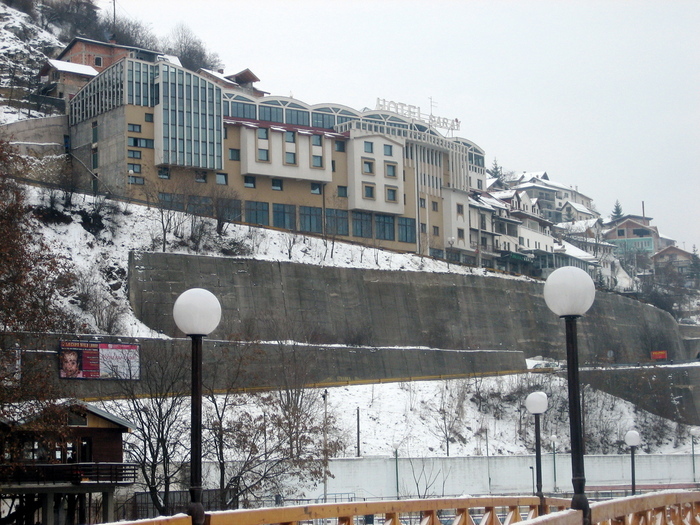 The brewery is built on the city's largest fresh water spring, and during the siege, it became the only source of fresh water to thousands of Sarajevans. It's no wonder that Sarajevska is by far the favorite beer around! The brewery is also located in the Bistrik district. 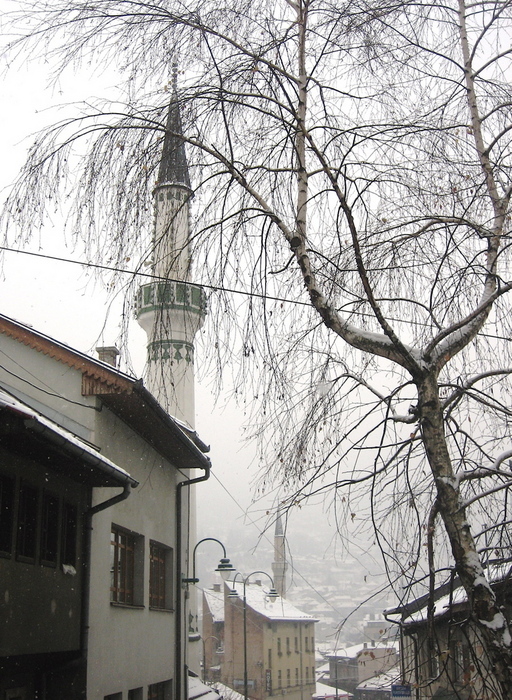 Located just to the right of the minaret in this photo, Inat Kuća (House of Despite) is a landmark of the city of Sarajevo. Today, it is one of the finest traditional Bosnian restaurants, but it was originally located on the other bank of the Miljacka. When the National Library was built in 1896, the owner insisted that his house was moved brick by brick to the other side of the river and rebuilt! 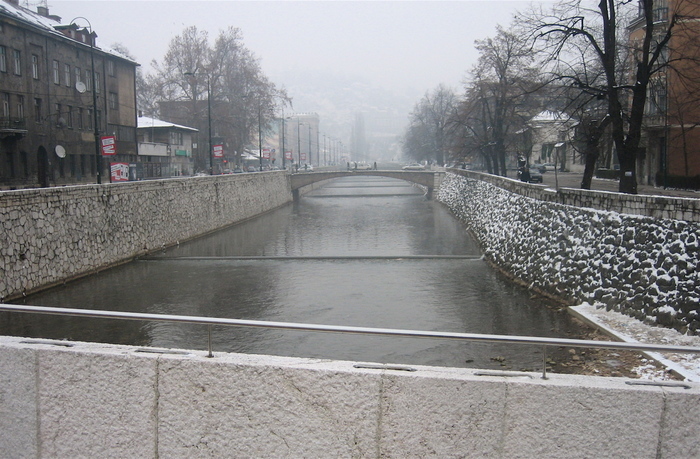 The bridges that cross the Miljacka are an important component of the city. Many of them are centuries old, many built during Ottoman times. All of them have played an important role in connecting the two sides of the river for purposes of accessing trade, communication, and family members. This building was originally the City Hall (Vijećnica), built in 1896 by the Austrian-Hungarians to reflect the Turkish architecture of parts of Sarajevo. It is truly a beautiful building. The city government was housed in Vijećnica until after World War II, after which it became the National Library. 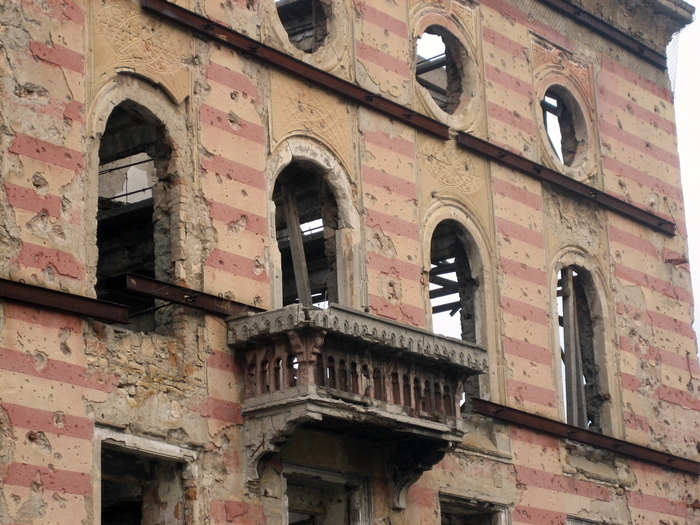 When it was destroyed by Serbian bombs in 1992, 90% of its valuable contents were obliterated. Such a tragedy for the country! We visited the Musej Sarajeva (Museum of Sarajevo) today. It has a wonderful collection of items from all eras of Sarajevan history. 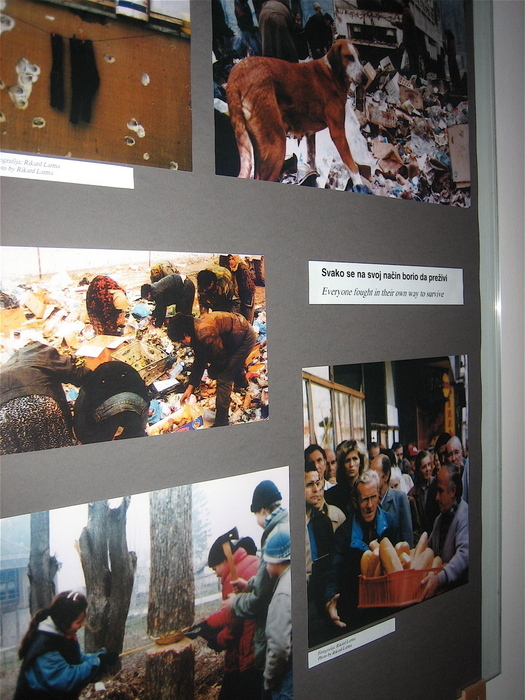 One that particularly touched us was an exhibit called Children of the Beseiged Sarajevo. From the exhibit's brochure: "Buildings and historical sites are not what makes a city. A city, above all, is made of its people and their spirit because it is the people that build, live and create that spirit. Unfortunately, there are people who destroy the buildings and kill the spirit of cities and their people, even children. Fortunately, there are children in the cities -- those little people who neither build nor destroy, yet without them it is impossible to imagine any city." The exhibit include toys and crafts made by children during the seige, using whatever they could find: socks, piece of fabric, scraps of paper, even bullet casings. 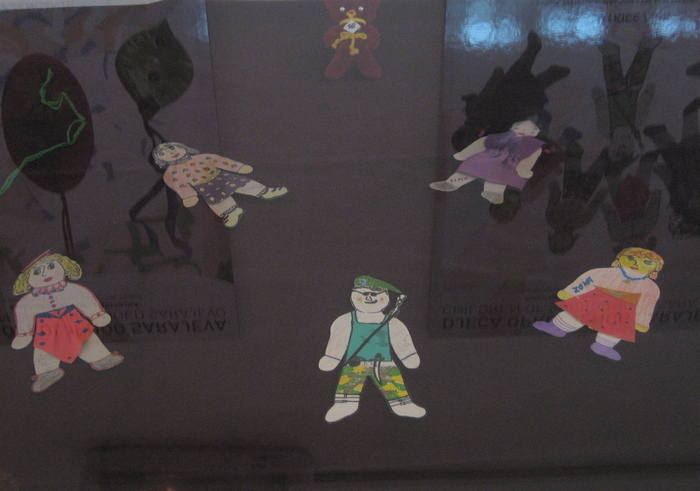 The above paper dolls were made by children in the hospital using syringe boxes. Notice the soldier. 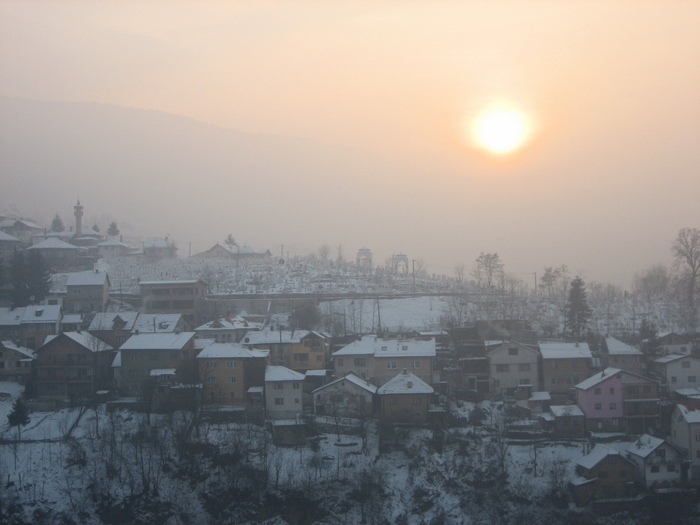 For the last few days, it has been extremely foggy here in the Sarajevo valley. Last night it was so bad that the plane Sarah, a friend from Garrett College who was flying in for a few weeks with Zummie, was traveling on couldn't land and had to turn back to Ljubljana, Slovenia, where she boarded a bus and 12 hours later was right back in Sarajevo. We took this photo from our hotel room at about 3:00PM looking straight into the sun. Now, that's foggy! This morning we traveled by train to Mostar, located in the southern part of the country in Herzegovina along the banks of the Neretva River, about 2.5 hours from Sarajevo. During the conflict, much of the city was reduced to rubble in battles between the Yugoslav's Peoples Army (JNA) and Bosnian Serb forces and then, beginning in May 1993, between the allied Bosnian Croat and Bosniak (Bosnian Muslim) forces. It was at this time that Mostar became a divided city and a brutal siege brought against the mainly Muslim population of east Mostar raged for 11 months. Everywhere we walked in Mostar we saw evidence of the battles that occurred more than 10 years ago. As Amir, our local resident guide, explained there just simply aren't enough investors to bring the buildings of the city back to what they once were. This photo shows the bullet and bomb damage to what used to be the most luxurious hotel in Mostar. The Bišćevića House in Mostar is located on the eastern banks of the Neretva and is a fine example of 17th century Turkish homes. Amir was able to talk the owners into letting us take a quick tour, even though the house was closed to the public on Sunday. 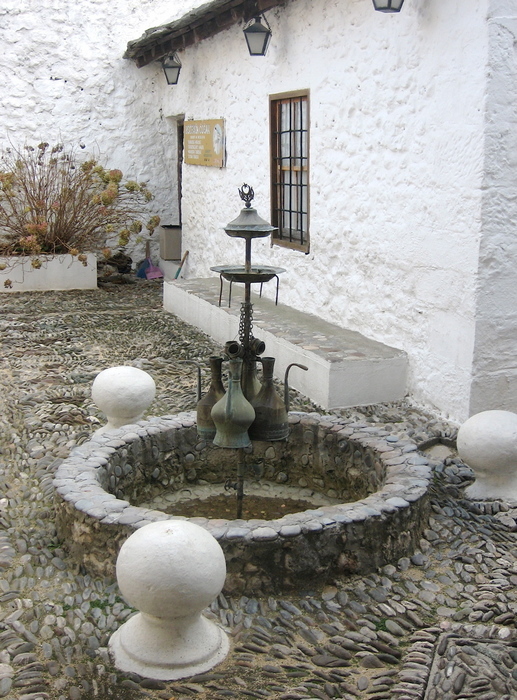 The courtyard, which we entered first, was beautiful and contained some period pieces, including the water jugs shown in this photo, and was typical of the Ottoman style in that it was surrounded by tall walls and paved with river stones in gorgeous patterns. 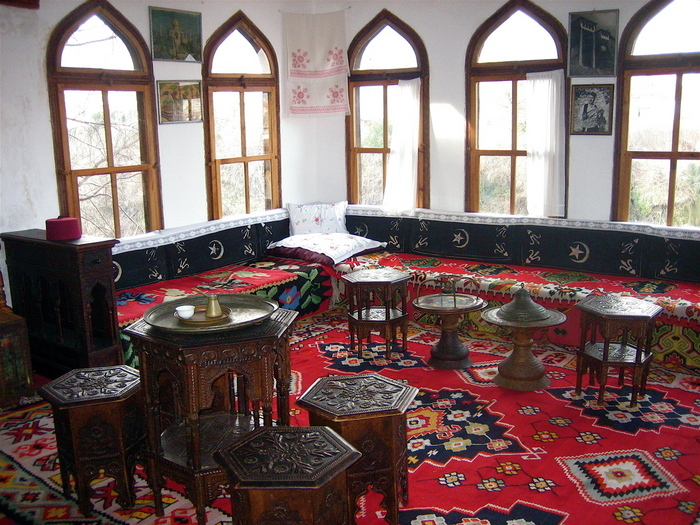 The conversation or gathering room -- or divanhan -- in the Bišćevića House is preserved in the authentic Turkish style with brightly colored carpets and benches around the exterior of the room. This part of the house hovers over the Neretva River, supported by pillars over 5 meters long. Sitting in this room, we could feel ourselves transported back to Ottoman times. Stari Most (Old Bridge) is the best known icon of Mostar and perhaps of Bosnia & Herzegovina. The original bridge crossed the teal waters of the Neretva for over 400 years. Amir told us that the bridge was designed by Hajrudin, a student of the great Turkish architect Sinan, and constructed after the wooden suspension bridge that proceeded it continually was washed away by the rise and ebb of the river. It was one of several bridges that connected the two sides of the river, all of which were systematically destroyed during the war. An exact replica of the old bridge was completed in 2004 (shown here), but unfortunately, it did little to reunite the divided city as had been the hope. The Halebija and Tara towers at either end of the bridge have always housed the bridge guardians and in Ottoman times housed ammunition. 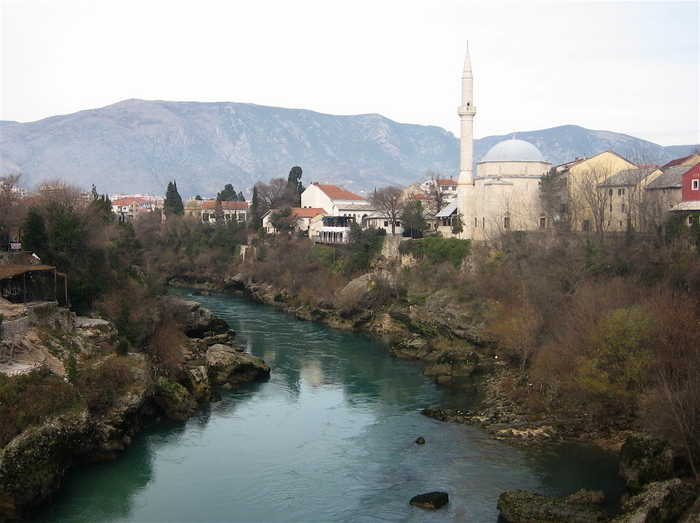 It is thought that name "Mostar" comes from the turkish term for "bridge guards." This photo was taken from the top of the Old Bridge, facing north. You can get a good sense of just how teal is the color of the water in the Neretva River. As mentioned earlier, during the Bosnian war, Mostar became divided along ethnic and religious lines: the Bosniaks to the east and the Bosnian Croats to the west. By many accounts, it was the Bosniaks who suffered far worse with many of them expelled from their homes in the western part of Mostar, their homes in the eastern part destroyed, and the men of fighting age sent to concentration camps or massacred. Several years after the end of the war, even though it was illegal to construct anything on the top of the mountain, a large cross was constructed by the Bosnian Croats, who are predominantly Catholic, and lit at night. It is visible from all areas of the Muslim community, and several people told us that they view it as a sort of threat....that one day, the Muslims will be expelled (or worse) completely from Mostar. Note the minarets of Muslim mosques in the lower left hand corner. Amir, who hopefully will come to Garrett College in 2008 as a student there, is a native of Blagaj, located just a short bus ride from Mostar. After getting off the bus, Amir took us to his parents home, where we enjoyed coffee and baklava with his mother. Blagaj, too, was greatly impacted by the fighting during the Bosnian war. But according to Amir, many believe that most of the citizens of Blagaj and its important sites were spared with the help of protection from otherworldly forces. We visited another example of houses built during the Ottoman times. There, Zummie and Amir posed for a photo along with a type of Turkish-inspired door knocker that adorns many doors in BiH. The Dervish Tekijah -- or house and monastery -- was built in the 1500's by the then sultan at the base of a 200 meter cliff for the dervish cults, Sufi Muslim religious ascetics known for their extreme poverty and austerity. Since those early days, those who follow the dervish way of life have been gathering here, at least once a year, to commune and pray. The house itself is of great interest for its woodwork, Arabic style of plumbing, and methods of keeping women out of the sight of strangers. But, sitting inside listening to the babbling of the River Buna and its source, one experiences a certain kind of calm that can only be mystical. One of the otherworldly forces that may have been at work in saving Blagaj from further destruction during the war was that of the Dervish Tekija. The house is one of the most mystical destinations in all of BiH. As such, there are certain protocols that must be observed before one can enter the house....specifically, shoes must be removed and women must cover their heads with a scarf of some kind. 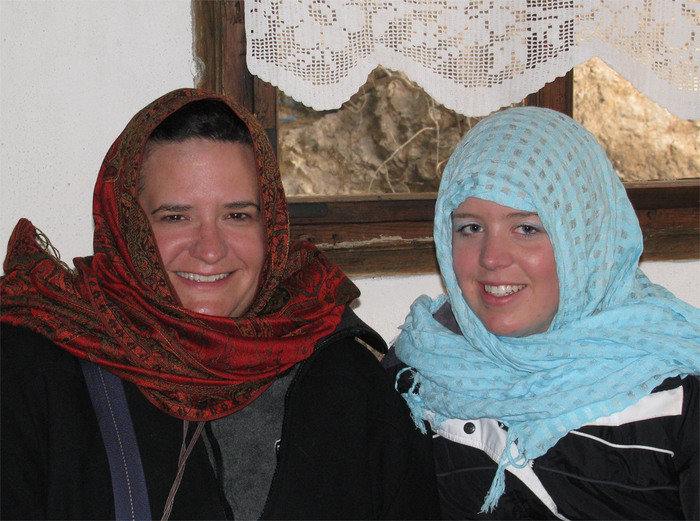 Here, Judy and Sarah sit inside the Dervish House adorned with scarves. To be honest, it was rather freeing wearing the scarves; no need to worry about the state of one's hair! 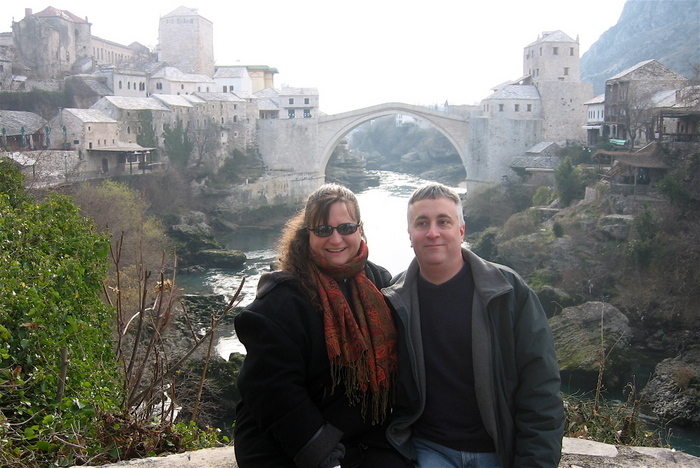 After visiting here, we headed back to Mostar and the train ride to Sarajevo. This morning, we went by tram (our first ride on it alone!) to meet Zummie and Sarah for coffee. We then got back on the tram and headed out towards Ilidźa and the Tunnel Museum. 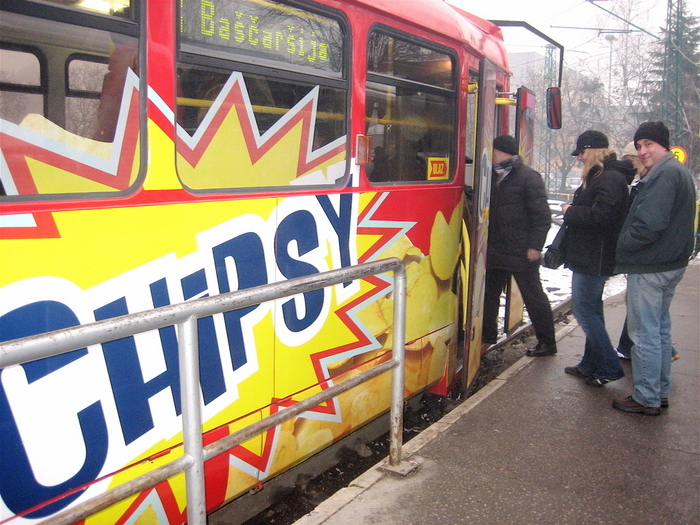 The tram in the picture here is a newer one, adorned with the Chipsy (a brand of potato chip) logo. The siege of Sarajevo came when the Yugoslav Army joined forces with the Serbs, who wanted to create a "Greater Serbia" by annexing territories in which Serbs lived and expelling or in other ways eliminating peoples who stood in their way. 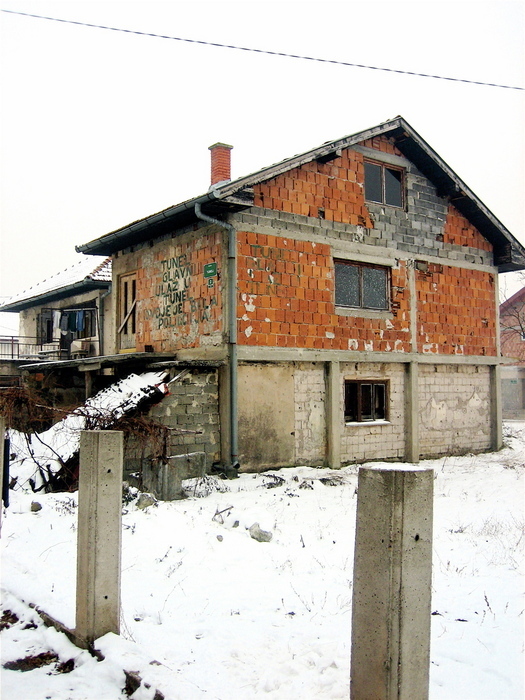 In the hills of Sarajevo, these conjoined forces attempted to occupy the city but were met with fierce opposition from make-shift, untrained Bosnian Muslim troops. They did, however, surround the city in a siege, keeping people in the city and food, water and other supplies out. In July 1992, the UN took control of the airport from the Serbs in order to airlift food to the Sarajevan people, in exchange for the agreement that the airport only be used for UN purposes and that no one else, including Sarajevans themselves, could make use or cross the airport. 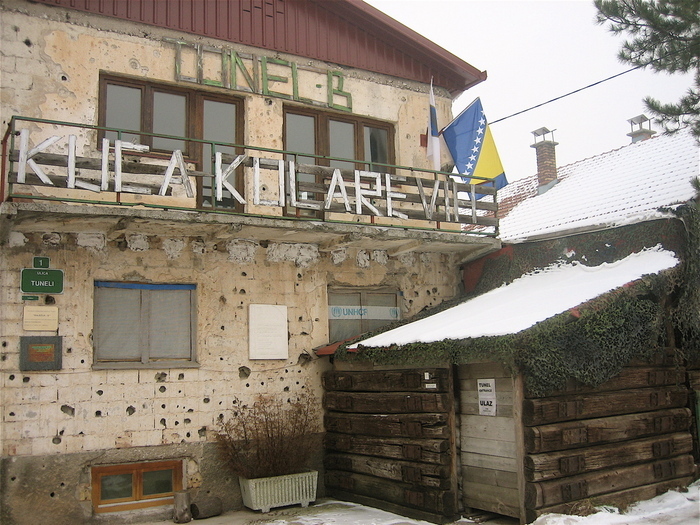 The airport, however, was of great strategic importance to the Bosnian army because it connected the besieged city with the free Bosnian territories. Without being able to cross the airport, the Bosnians could not survive nor defend themselves. It was decided that if they could not cross the airport, they would have to go under it. In January 1993, construction of a tunnel began. It was this tunnel that upon completion brought hope, arms, and sustenance to the people of Sarajevo. The Kolar family, upon whose land the entrance of the tunnel in the free territory existed, keeps their family home much the same as it was during the years the tunnel was operational. Today, it is a museum, one that allows visitors to experience part of the tunnel for themselves. 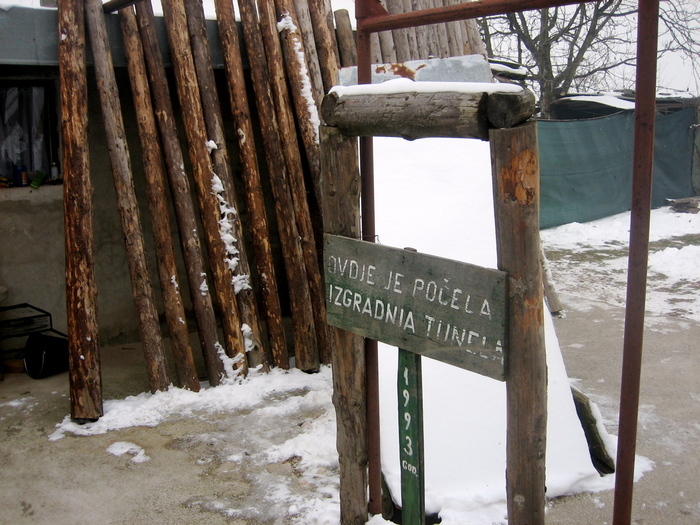 The tunnel was dug using hand-held tools starting from both sides, one in Butmir on the free territory side of the airport (where the Kolar family house is) and one in Dobrina on the Sarajevo city side of the airport. 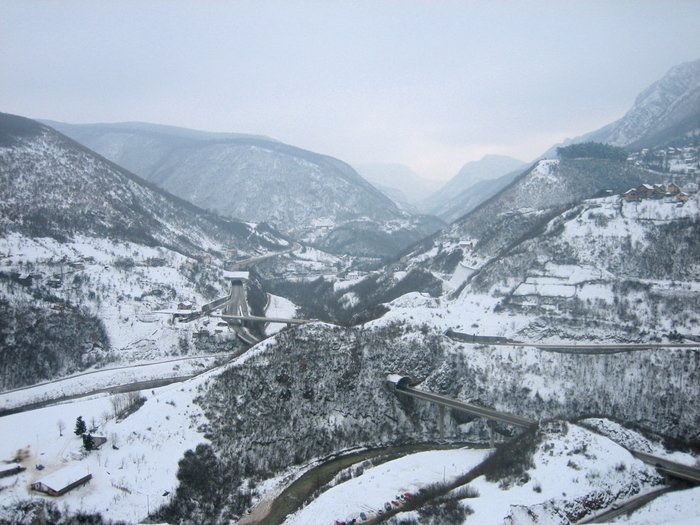 The photo above is of the place in Butmir where the tunnel was started. It took 150 men 4 and a half months to complete the tunnel. A total of 2800 cubic meters of earth were excavated, and 170 cubic meters of wood and 45 tons of iron were used to line the tunnel. It was 800 meters long and 1.5 meters wide; adults would have to stoop in order to pass through the tunnel. On the night it was completed, 12 tons of army material and supplies were taken into the city. On a average day, more than 4000 people would pass through the tunnel. But it wasn't only people and supplies that were transported through the tunnel. The city lacked electricity, and there was an oil shortage. Additionally, communication lines had been severed. The tunnel also came to transport electricity, oil, and telephone lines. Even though the tunnel was very wet, often requiring users to wade knee-deep in water from one end to the other, the pipes that carried these resources were literally touching the users' shoulders. The warning sign in the photo above cautions users to beware. We were able to go through about 20 meters of the original tunnel, which of course was well lit, dry and without live electric lines. Our experience was quite different from that of the people who used the tunnel during the war. First and foremost, the tunnel was a military route with a very strategic defense purpose. The taxi driver who drove us from Ilidźa to the Tunnel Museum himself had used the tunnel many times during the war, often carrying grenades and other arms into the city. Users of the tunnel first had to check in at the Police Station across the street from the Kolar house before they could go into the tunnel. Even though today is Christmas Eve and reflecting so much on the war may seem like a sad way to celebrate, we were struck by the courage and tenacity of those who saw a problem, decided to do the impossible, and actually made it happen. It is amazing what the human spirit can accomplish! 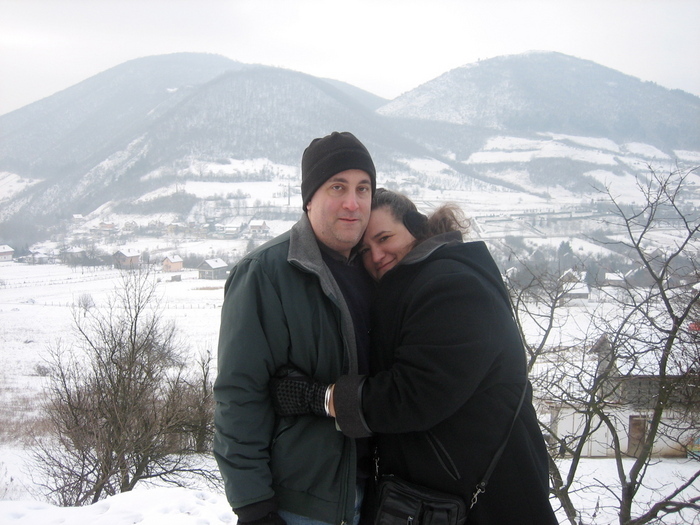 We were invited to join Enisa and Zummie at the home of Tom and Jane Young, US government officials working in Sarajevo, for a Christmas Eve get together. 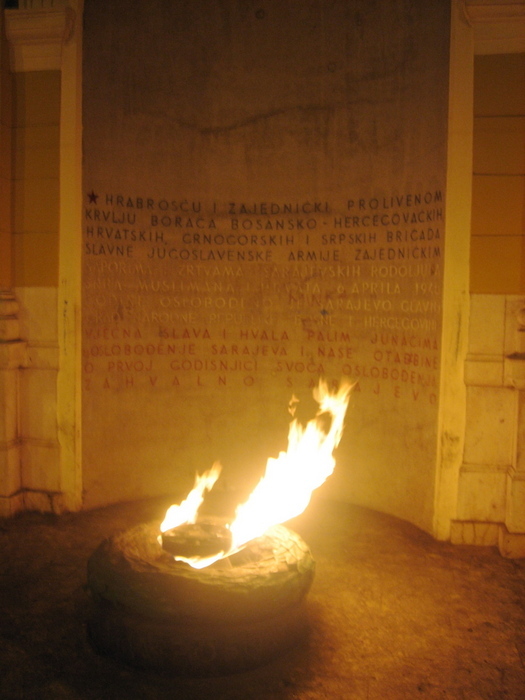 On the way, we passed the Vjećna Vatra (Eternal Flame). It commemorates the Serbs, Croats, Muslims, and others who lost their lives in liberating Sarajevo from the fascists in World War II. 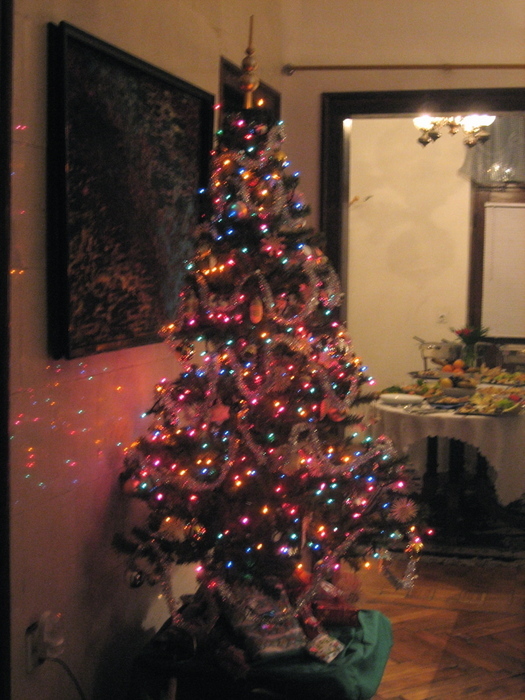 We had a nice evening at the Youngs, and their Christmas Tree was beautiful. Tomorrow, Christmas day, will be a day much the same as any other day in Sarajevo, as few people here celebrate Christmas. Not that we are complaining! Still, it was nice to see a Christmas tree tonight. 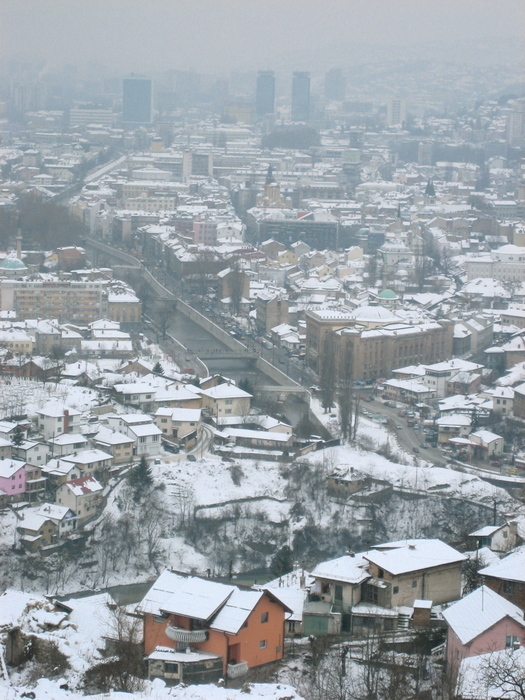 We had a white Christmas in Sarajevo. All day, a gentle snow fell, making an already beautiful city even more beautiful. We had a full day. On one hand, it didn't at all seem like Christmas. And on the other, moments made it the most memorable Christmas ever. 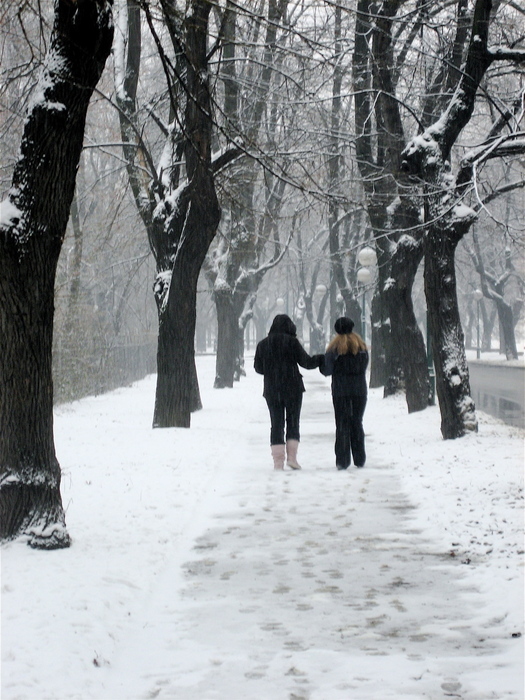 In this photo, Zummie and Sarah walk ahead, enjoying the snow fall, as we explored three museums this morning. Our first museum was the Historijski Musej BiH, the Historical Museum of Bosnia & Herzegovina. It was unlike any museum we had ever visited: sad and yet powerful. The museum receives very little funding, and as a consequences, has no heat. The staff inside the building were as bundled up as those who were passing outside in the snow. One told Zummie that the staffers were paid very little in the way of salary and that often came late. Yet, they are all committed to preserving the history of their country, and so they persist. I have never been so cold while visiting a museum. But as we walked around an exhibit that chronicles Sarajevo under siege, it was somehow fitting. Those who survived the war lived every winter day in freezing conditions. 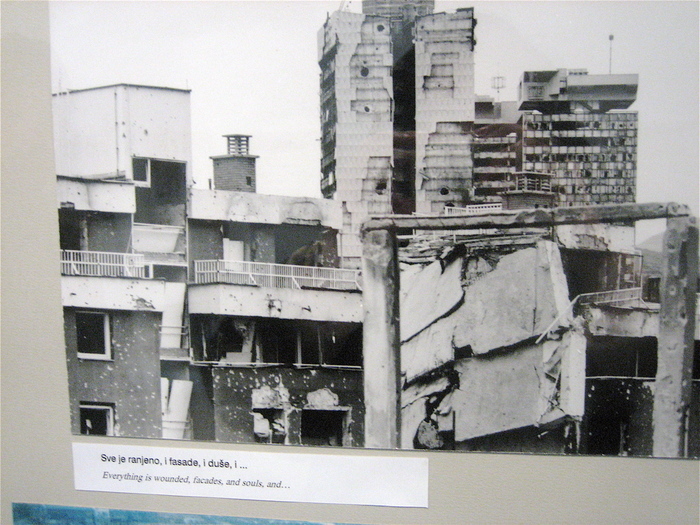 The caption on this one picture in the exhibit really stayed with us: "Everything is wounded, facades and souls." And this caption stayed with us, too. It was part of a collage with images of people and dogs rummaging through trash piles; socks hanging next to grenade holes; people standing in long queues waiting for bread; a tree on city property being cut down, invariably for firewood. The caption read "Everyone fought in their own way to survive." After visiting the Musej Sarajeva, 1878-1919 which focused on the events before and after the assassination of the heir to the Austrian-Hungarian throne, Archduke Ferdinand, we toured the Svrzina Kuća (Svrzo House). 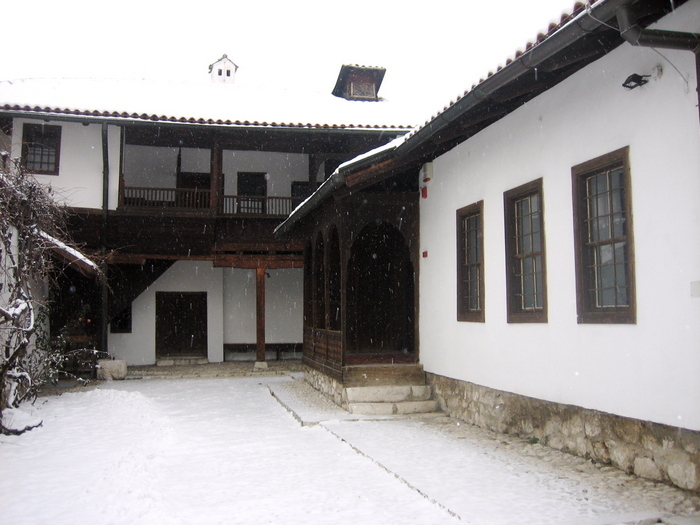 The house, located in what was a neighborhood where wealthy merchants lived, is a fine example of an 18th century Bosnian Muslim home. The high walls that surround the typical Turkish courtyards mark the intimate and secret lives of the wealthier begs (beg is a title of respect and higher class). The house itself is divided into a selamluk (part for the men and boys in the family) and a haremluk (part for women and girls) into which the family was segregated during the day. The haremluk has windows and balconies that are shielded from the view of others who were both inside and outside the house. The house was lived in by first the Glodos family and then changed hands when the last Glodos male heir died through the maternal line to the Svrzo family, who lived in the house until the 1950's. 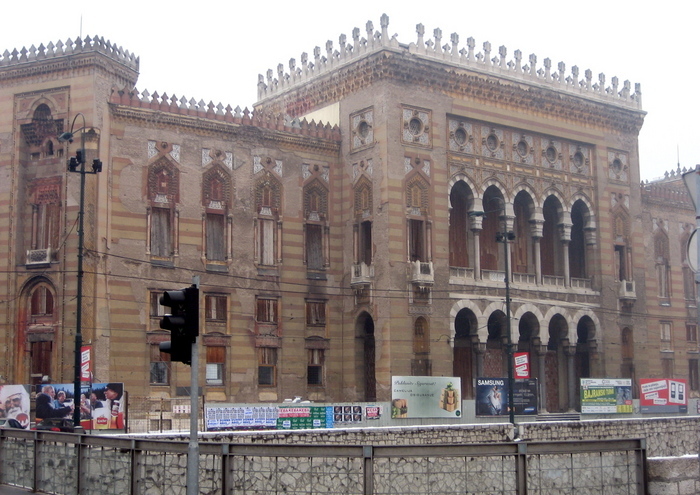 It was then bequeathed to the Muzej Sarajeva and has remained a museum opened to the public ever since. This picture is of one of the haremluk rooms in the Svrzina Kuća. Notice the baby cradle and the bed on the floor where the mother or nurse would sleep to be near the child. 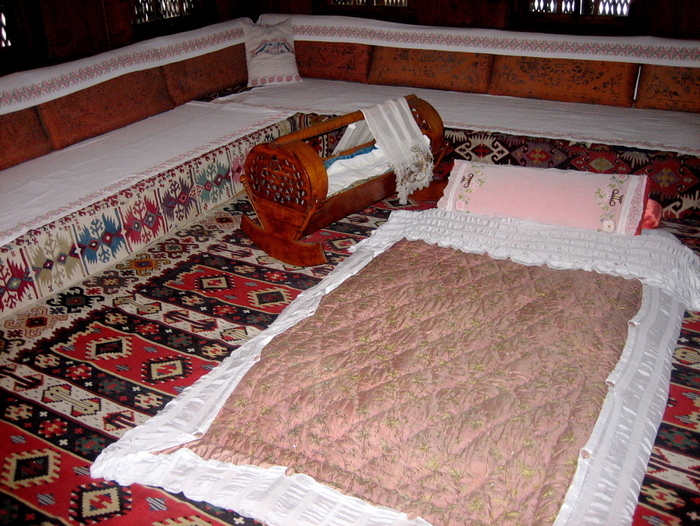 Actually, all the Turkish houses that we saw had rooms that served as sitting/bed/gathering rooms, with pillowed benches around the edges and beds that would be unrolled onto the floor during the night. Zummie, Ken and Sarah stop to pose for a picture. The balcony is one in the haremluk. If Ken were to have really been there in the 18th century, there most likely would have been a pretty severe penalty! One of Zummie's closest friends, LJ, sent us to her favorite Turkish coffee house. It was well off the beaten path in the Baščaršija and was a tiny, charming place where we enjoyed a cup of coffee (well, Ken and I enjoyed a filjan of Bosnian coffee!). We also decided to partake in another Turkish custom: smoking a hookah. A hookah is a single or multi-stemmed water pipe device for smoking that operates by water filtration and indirect heat. It can be used for smoking many substances, such as herbal fruits and tobacco. We went the herbal fruit route with apple. It was an interesting experience, one I am glad we had. Still, the consensus was that once was enough. Here is Sarah posing (and wearing her Amerikanka necklace...um, passport holder!) with the hookah. 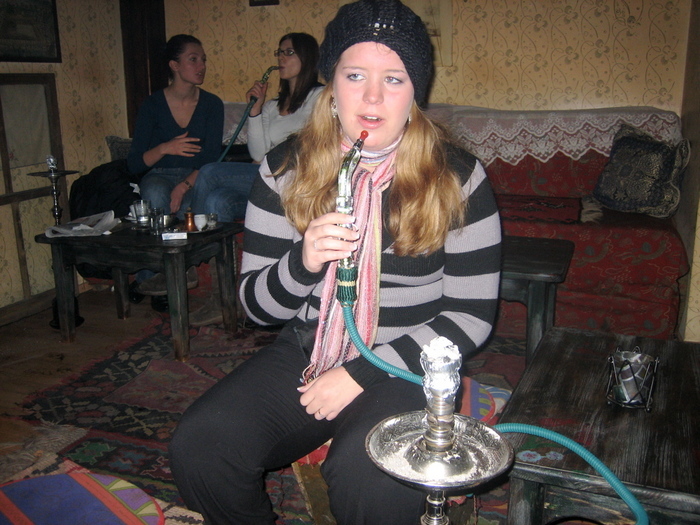 Notice the women behind her...hookahs just aren't for guys anymore!! Another shot of Zummie, Sarah and Ken, this time outside of the Turkish coffee house. The snow was still falling in the afternoon as we prepared to do a little bit of shopping in the Baščaršija. Christmas night was spent with the Balihodžić family. They are such a loving group of people and made us feel truly cared for and honored. Here Ken is pictured with the guys -- Eldin and Haris -- with their new Sarajevo (go red team!) caps and the girls -- Almira and Lamija -- with their new stylish hats. We are going to miss seeing them everyday, but we are grateful to have them with us in our hearts. Both of us hope that your Christmas was as memorable, as happy, and as filled with love as was ours! Tomorrow, we head home to Garrett County. In many ways, this has been the most powerful trip we have ever taken, most likely due to the fact we spent many of our days with a family who opened their home and hearts to us and also to the fact that we saw first hand what war, hate, and religious and ethnic intolerance can do to a people. We are very grateful to have had this experience, one which will stay with us long after we return home.